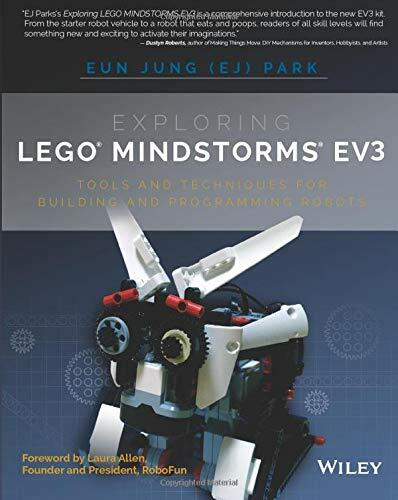 [PDF] Exploring LEGO Mindstorms EV3: Tools and Techniques for Building and Programming Robots | Free eBooks Download - EBOOKEE! Posted on 2018-01-14, by luongquocchinh. Description: The essential guide to building and programming LEGO EV3 interactive robots. Exploring LEGO Mindstorms: Tools and Techniques for Building and Programming Robots is the complete guide to getting the most out of your LEGO Mindstorms EV3. Written for hobbyists, young builders, and master builders alike, the book walks you through fundamentals of robot design, construction, and programming using the Mindstorms apparatus and LEGO TECHNIC parts. Tap into your creativity with brainstorming techniques, or follow the plans and blueprints provided on the companion website to complete projects ranging from beginner to advanced. The book begins with the basics of the software and EV3 features then lets you get to work quickly by using projects of increasing complexity to illustrate the topics at hand. Plenty of examples are provided throughout every step of the process, and the companion website features a blog where you can gain the insight and advice of other users. Exploring LEGO Mindstorms contains building and programming challenges written by a recognized authority in LEGO robotics curriculum, and is designed to teach you the fundamentals rather than have you follow a "recipe." Get started with robot programming with the starter vehicle, Auto-Driver Explore the features of the EV3 brick, a programmable brick Design robot's actions using Action Blocks Incorporate environmental sensors using Infrared, Touch, and Color sensors Expand the use of data in your program by using data wires with Sensor Blocks Process data from the sensors using Data Operations Blocks Using Bluetooth and WiFi with EV3 Build unique EV3 robots that each presents different functions: the Spy Rabbit, a robot that can react to its surroundings a Sea Turtle robot, Mr. Turto the Big Belly Bot, a robot that eats and poops and a Robotic Puppy Guapo Discover ideas and practices that will help you to develop your own method of designing and programming EV3 robots The book also provides extensive programming guidance, from the very basics of block programming through data wiring. You'll learn robotics skills to help with your own creations, and can likely ignite a lasting passion for innovation. Exploring LEGO Mindstorms is the key to unlocking your EV3 potential. 2017-12-08[PDF] The LEGO MINDSTORMS EV3 Laboratory: Build, Program, and Experiment with Five Wicked Cool Robots! No comments for "[PDF] Exploring LEGO Mindstorms EV3: Tools and Techniques for Building and Programming Robots".